David is coming to New Who for the first time, having loved Classic Who as a kid. Tehani is a recent convert, and ploughed through Seasons 1 to 6 (so far) in just a few weeks after becoming addicted thanks to Matt Smith – she’s rewatching to keep up with David! Tansy is the expert in the team, with a history in Doctor Who fandom that goes WAY back, and a passion for Doctor Who that inspires us all. We’re going to work our way through New Who, using season openers and closers, and Hugo shortlisted episodes, as our blogging points. Just for fun! Our first review (“Rose”, S01E01) can be found here. Okay, so we’ve seen the year five billion and met a creepy human skin in “The End of the World”, gone back to Victorian England for a very Sherlock Holmes-y style ghost busting episode in “The Unquiet Dead”, been introduced to the Slitheen and their self-centred plans in “Aliens of London” and “World War Three” (and Harriet Jones! I love her), and now we’re up to “Dalek”, the first of Season One’s Hugo nominated episodes. The Doctor and Rose are getting to know each other, as we get to know them, and it must have been interesting for long term fans to watch Eccleston in this role, after such a long break from the show. Tansy, any thoughts to share on what that was like, for those early episodes, before we get to “Dalek”? Mostly for me it was a wild ride – I had no particular interaction with fandom, and so I wasn’t juggling the kind of critical attention that overwhelms Doctor Who these days. But after months of seeing nothing but “Rose” as evidence of what New Who would be about, The End of the World was an enormous delight – aliens and space stations, and the unrolling mythology of human futures! Looking at it now, that episode suffers a lot from budgetary issues, but at the time it showed us the kind of creativity and ambition we were going to associate with the new series. Also the use of actual music – not just Murray Gold being a genius, but Britney Spears! – was a shock to the system. Was “The Unquiet Dead” showed us also that Earth’s history and time travel were going to be important – something we had learned not to take for granted about Doctor Who since the end of the Hartnell era, really. “Aliens of London” and “World War Three” are generally dismissed by fans now thanks to the silliness of the Slitheen (though gotta say, the kids love em! ), but they were mind blowing at the time too – the idea that we would be exploring a contemporary Earth where everyone knew aliens were real was a fascinating one, which RTD would flirt with throughout his era. I found “The End of the World” much stronger than the Slitheen episodes, which appeared to be played a little too much for laughs. I thought too much about what they did to the pig though, that’s actually pretty horrifying when you think about it. It was also interesting seeing the impact that Rose’s leaving had on those around her, you don’t always think about what happens to the companion’s lives outside oft heir adventures with the Doctor (as I think Tansy has alluded to). “The End of the World” also had some good scenes for Rose where her homesickness comes to the fore, and the Doctor showing his compassion with perhaps the best phone modification imaginable. And I always love seeing heaps of different aliens. “The Unquiet Dead” was a bit of a throwback to some of the “historical” episodes I grew up with, where we see that it isn’t just about outer space or the future, but about the past as well. The repartee between the Doctor and Charles Dickens was great fun, and it was good character development for Rose as she gets some idea about the vast distances she is travelling in both time and space, and how different her life was from the maids in its scope even before she met the Doctor. Tehani, I loved Harriet Jones too … so VERY English! I love Harriet, she’s always brilliant. And worth noting that getting actors of the calibre of Penelope Wilton and Simon Callow (not to mention La Eccleston himself!) was a big deal for this first season – after a waning decade of Doctor Who in the 80′s where it was seen as a bit of a joke by those who didn’t love it, it was beyond delightful to see the show redevelop into something that every actor wanted to appear in. But never mind all that, let’s talk about DALEKS. It was a bit of a shock actually, to see the Doctor so instantly horrible to the Dalek. I mean, I know they’re his nemesis and all that, but after lulling us into a false sense of geniality, he strikes out like that. But it also helped show why he has a companion – Rose and her compassion (well-meaning, if rather misplaced) remind the Doctor that even he has blind spots. This became quite a theme throughout the new seasons I think – the Doctor is brilliant and manic and incredible, but without his companion/s, he can be rather, well, inhuman. I really appreciated the Ninth Doctor in this – not as much as in a few later episodes, but while I had enjoyed Eccleston’s performance all along, this showed the depths he was willing to bring to the part. I love that they followed up on the chilling revelations in “Rose” about the loss of his people. The Time War is cleverly seeded all through this season, but never more than in this particular episode. And I think it’s important that the Doctor isn’t completely likeable – his comedy collides with his emo-ness in the Dalek reveal scene in particular, and you see how very damaged he is. That’s important. The Doctor is completely unhinged here. It makes you realise something terrible has happened for the Doctor to be exhibiting such rabid hatred. I can’t remember him ever acting like that before, even when he had to do some rough things (thinking McCoy Era especially) there was always a tinge of regret. A new Doctor in more ways than one. I have to say, the idea of the Time War and the loss of Gallifrey as something in the immediate past was a masterstroke on the part of the new production team. It was a new backstory that could be told (and shown) simply and to maximum emotional effect, that didn’t contradict anything of the past, but also didn’t require a Classic Who Handbook for new viewers. Christopher Eccleston really seized upon the meaty material in this episode, and didn’t shy away from the idea that the Doctor can be a monster as well as a hero. It’s also interesting that he doesn’t deny his love for Rose, even here. I mean, the Doctor probably loves all of his companions, right? But not LOVE love. Which is how the Dalek means it. I’m not convinced that anything other than a platonic love is being discussed at this point. It’s too soon to be credible, apart from anything. But you can’t beat a Dalek talking about love when it comes to dramatic irony – important to note that Daleks are not the ones who have had all their emotions removed! They just tend to concentrate on the ‘rage’ and ‘revenge’ category of feelings. Oh yes, that’s true! Still, I thought the way it was said was rather provocative, and in context with what comes later … well, we’ll get to that. The impression that I have gotten so far is that the Doctor is trying very hard to impress Rose, he is almost like a high school kid at times. Not sure how much of that is actually romantic, the Doctor has always been full of childlike wonder, but he makes lots of wild promises of taking her to distant places and times that are almost boastful, and he is attitude to Rose’s boyfriend is almost as if he is jealous of any attention she gives anyone but him. I don’t think I was sold on the ending of “Dalek” – I suppose it made sense but hrrmm, not a big fan of the Dalek enjoying the sunlight then begging to be ordered to die. 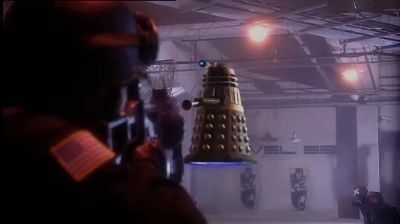 And I have to say, does it ever get old that we continually get “the last Dalek ever”? It does later, but at this point, it’s a unique idea and storyline. The thing that this episode does so well is to give us a single Dalek, and terrorise us with it – it basically restores the mythology of the creature after forty years of jokes about pepperpots and jokes about stairs. My favourite part is before the sunlight bit – where the Doctor storms in to rescue Rose after she has started to empathise with the Dalek, and she points out which of the two is pointing a gun at her. This is where she really shows her value as a companion, I think – and we see the beginning of the Doctor starting to emerge from his dark cloud. Tansy, that is exactly what I loved about it! This is Doctor Who taking itself seriously, but not in a pompous way. There is almost a tendency in Doctor Who to try and preempt it being laughed at by getting there first, and the Daleks are a classic example of that with jokes about stairs. But, here we see the Daleks presented as what they are, one of the most lethal creatures in the Universe and devoted to the death of every other living thing. I felt sorry for the Dalek at the end, Rose gave it enough humanity for it to know that it could never be human. I thought that whole scene was very powerful. Also it has to be said, that scene with the dripping water, where the Dalek kills EVERYBODY, is also devastating. None of this killing one at a time business, plus it’s beautifully shot. Agree completely, that was brilliant. It goes back to the idea that the Daleks are incredibly good at killing, that’s what they are designed to do. It’s amazing how visceral the viewer reaction is to the Dalek onscreen. Is it the voice? My first reaction was to go back to being a seven year old and hide behind the couch! They are simply scary, no bones. Something I wanted to note about this episode, which might not mean anything to either of you, is how much it foreshadows (or possible inspires!) the spin off series of Torchwood, and to some extent the Sarah Jane Adventures. The whole concept of reclaiming artefacts and technology from random alien incursions is a really cool one, and is another reminder that there should be domestic consequences of all these alien invasions that the Doctor has been fighting off for decades. As with the consequences of the companion leaving her life behind at the sniff of a jelly baby, this is a theme that will be openly explored in New Who, where it was largely ignored in the old days. Bit of a tangent, but I always loved the episodes where the Doctor had to deal with something that he had left lying around, or a loose end he hadn’t tidied up. “Face of Evil” is a classic example, where we see that sometimes there are consequences that linger on after the TARDIS has dematerialised. Tansy, even I noticed how much this was discussed, in subtext or right up front, throughout the series. In fact, it makes me wonder how Rory and Amy will go when it all ends for them. Oops, sorry David, “spoilers”! And, ahem, haven’t seen any Torchwood yet. Should I? I’m a huge Torchwood fangirl so I say yes, yes! For continuity’s sake I recommend trying out season 1 of Torchwood after the New Who Season 2 finale, though I know this is all rewatch for you Tehani, so it’s less of an issue. If you like Captain Jack later this season, I’d say give it a chance. Then if you’re interested in slotting it all in, Season 2 of Torchwood can be watched quite tidily after season 3 Doctor Who (or between episodes 6-12 of Season 4 if you want to get fancy) and then as long as you put away Season 3 before David Tennant finishes his run in The End of Time, you’re all good. Am I the only person who watched this episode BEFORE meeting Rob? I think he was a little disappointed that I liked it, in contrast to Alisa telling him to his face that his was the episode that made her give up on the show because she hated it so much. Sorry, Rob. I still think it’s awesome. LOL, no you aren’t, I haven’t met him at all. If I do I will try and hide how much I enjoyed this episode! This entry was posted in Geek, Pop Culture, TV and tagged Doctor Who, New Who Conversations, Tansy Rayner Roberts, Tehani Croft Wessely on September 2, 2011 by David.